Yesterday, We covered that we have had many experiences of doctor’s not respecting their patient’s time in the waiting room. 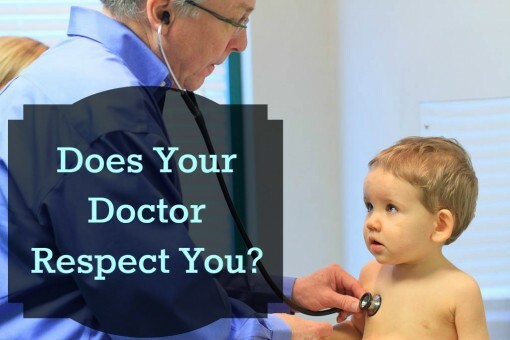 Today we are going to share about how some doctors carry that disrespect into the exam room. Many doctors probably start their practice with all the good intentions in the world. They want to help the masses and do no harm. In my experience, doctors are not evil. My brother in law is in rotations soon to become a doctor. His intentions are to learn about diseases and how to help people. I think he will be a great doctor! However, I hear countless examples of how doctors lose respect for their patients over time. I have had personal experiences where I became a file chart instead of a person. My issues weren’t fully heard and I was rushed in and out just to get another patient in the room. There are some things I’m pretty passionate about, and one of those things is don’t mess with natural processes including pregnancy, labor and birth when able. It is not uncommon for doctor’s to overstep their part in the matter and bring unnecessary interventions leading to more complications: baby in distress, failure for mother to progress, and cesarean sections. I get it though. Doctors want to “fix” the problem (the pregnant woman). Doctor induced “sick” patient to “heal” her of her pregnancy quickly. Mother’s body wasn’t ready for labor. Medications don’t work effectively. Baby wasn’t in the best position for birth. Baby is in distress… Mother fails to progress… Delivery ends on the operating table. The Doctor didn’t respect Nature or the pregnant woman’s body. We have been very lucky and haven’t had very many times when we have had to deal with a sick child. I feel like prevention is key with good nutrition, vitamins, and Fermented Cod Liver Oil Blend . However when I do have to deal with sickness, I don’t go straight to the doctor for a fever or signs of a cold because I know that most doctors don’t respect the body’s ability to fight off infections on its own. Fevers are not something to be scared of, they are actually a GOOD sign that your body is responding and fighting off the infection. By reducing the fever you are putting your all star player on the bench to watch the game. Sometimes the body will respond by raising a fever even higher to counteract the fever reducing medication. Antibiotics are overused in doctor’s offices. These powerful tools are great when they are actually needed, but are far too often relied on. Instead, I reach for natural antibiotics like garlic and tea tree oil, and take immunity boosters like vitamin C and Echinacea Immune Support Tea. In my experience, traditional doctors are more likely to prescribe a pill to fix the symptoms instead of focusing on the underlying cause of those symptoms. This tendency makes the patient feel like they have been “healed” when the underlying issue may simply be masked by this treatment, only to find the symptoms resurface. Which results in going to the doctor to be treated again… and again… and again. This becomes both frustrating for the patient and needlessly expensive. This is not the case for every doctor and I have personally found to love my Naturopath, Midwife, Chiropractor and Doctors of Osteopathy (DO) because they focus on the whole person. I went to a gynecologist once who prescribed me Clomid to induce ovulation without doing any blood test or anything only because my cycle wasn’t regular. He didn’t ask me about my diet, my stress level, or any information that may lead to a reason of why my period was irregular at the time. Who knows what my hormones were doing to suppress ovulation??? I have no idea… I just pop a pill and now I’m ovulating. Adam went to a dermatologist for a year for a chronic skin issue that I was unable to treat with home skin care. This dermatologist prescribed steroids and other medications for a year with no ultimate cure. His recommendations were to continue the steroids indefinitely. We started seeing a naturopath, who was able to run some tests to find that Adam was having difficulty detoxing his system. His skin flare up was a symptom of a deeper underlying issue. This dermatologist gave no indication that Adam’s issue could be a more global reflection of inflammation and frankly put him at harm for dismissing that it could be related to more than just a skin issue. I am very glad I live in a world with doctors who know more about illness than me. However, I do think that we also need to take some responsibility for our health and understand how to improve our immune systems and focus on preventative health. I would encourage everyone to find a doctor who respects you and respects natural processes. You may be lucky to find a Doctor of Osteopathy in your area, or another type of doctor who focuses on you as a whole person and not as something they can fix by prescribing a pill. What is your experience with doctors, do they respect you?